Amy grew up in Louisville, Kentucky and resides with her husband and two children. She obtained her BS in human physiology, with a minor in nutrition at The University of Tennessee, with certification from American College of Sports Medicine as a certified exercise physiologist. She obtained her BSN from Bellarmine University and MSN as a Family Nurse Practitioner from Ball State University. 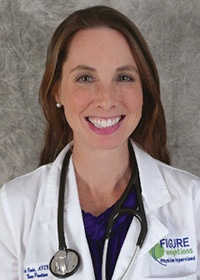 She has experience in cardiac rehabilitation, emergency medicine and immediate care. At Figure Weight Loss, Amy assists our physicians and her passion for a healthy lifestyle assists our patients in achieving their weight loss goals.